One of the first things almost any English visitor to Scotland will notice almost the instant that they get off the train is how “white” our country is. Â Partly this is because the sun is an infrequent visitor, but compared with England, where Â almost 10% of the population is of minority ethnic origin, and London in particular with over 30%, Scotland is white, very white. Growing up in small town 70s Scotland, my first experience of ever meeting anyone Black was around four years old, when my Granny Â called me over excitedly one day when we were out shopping to “see the Black baby”. Â I came over curiously, as my baby obsessed Granny cooed over a 9 month old Black infant in a pushchair, anxiously watched by her (white) Mother. Â Once her baby lust was saited, and as we were walking away, she commented that she was glad I had seen this because I would never see another one. Â Such was the exoticism of ethnic minority communities at that time in Scotland, and when in High School, a Chinese girl joined our class and our teacher walked over to her and asked her very loudly and very slowly “Do…you….speak…..English?“, only to meet with the reply of “Aye, how, dae you no?“, he looked visibly taken aback. Scotland has changed considerably in the intervening 30 odd years, there are established minority communities in most of our towns and cities. Â A major change in the ethnic composition of Glasgow in particular came at the start of the last decade with the dispersal programme, which bussed thousands of asylum seekers north and dumped them in decrepit tower blocks in Springburn. Â In the intervening decade our new citizens have grown in confidence and stature, establishing UNITY – the Union of Asylum Seekers. 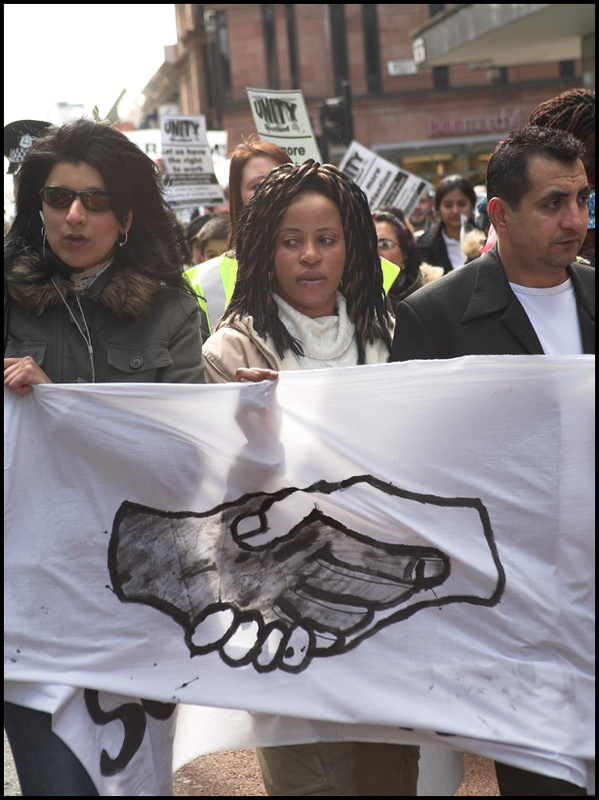 From an initial, somewhat chaotic, meeting with major language barriers, cultural differences and aÂ despondencyÂ born of frequent dawn raids and poor housing conditions, a support network was born. Â This network has now provided support for thousands of asylum seekers – from mustering defence comittees to prevent dawn raids, monitoring aslyum seekers signing at the Borders Agency to ensure that they are released after signing, providing practical items like clothing, food and kitchenware, a soup kitchen for destitute asylum seekers, a women’s support group and a list of locals who could take in homeless asylum seekers until accomodation could be arranged, guiding them through the tortuous andÂ bureaucratic mechanisms which comprise the asylum system. And it was through UNITY that I first met Senga [not her real name] and her daughter. Â Leaving an unsafe situation in an English city and with precarious domicile, she fled with her daughter and what little she could carry to end up on the doorstep of UNITY as the roch wind of Hurricane Bawbag blaw as t’wad blaw its last. Â Having heard of the support that UNITY offered she chanced her luck, again fleeing an dangerous environment for safer shores. Â It was lovely having her company for a week or so until herÂ accommodationÂ was sorted out (even if she did have terrible taste in TV viewing). Now Govan is a village and, as with many villages, everyone knows your business. Â So it is perhaps unsurprising that the appearance of a guest at my home would raise localÂ curiosity. Â I was somewhat taken aback tho, to answer the door one evening to find one of the local young team on my doorstep. Â “Are you shagging a Black man?” he asked me by way of introduction. Â On being told rather forcefully that it was none of his business, in the conversation which followed, I let slip that the tall dark stranger was actually a woman. Â “Whit? Â Its a girl? Â You a lesbo?” he said his eyes widening as he backed off three paces. Â I smiled and shut the door. Â A few nights later, as we waited in the local takeaway an elderly customer cooed over her daughter, reminding me for all the world of my Granny years before. Â On realising we were together she turned to me and said “You working wae her, aye? Â Ocht its nice tae see folks helping them that has nane“. Â On being informed that she was just a pal who was staying with me for a few days, a puzzled look crossed her face as collected her order. Racism and paternalism still exists in Scotland, but great strides have been made in recent years. Â UNITY has been a remarkable project, bringing together all them at hame wi freedom to ensure that a the bairns o Adaim can find breid, barley bree and a paintit room. Â Over 40Â years before the first aslyum seekers were shoved onto a bus without knowing even where they would end up, Hamish Henderson penned “Freedom come a ye“. Â HowÂ prescient the last verse proved to be. Â As Scotland considers her future, it is worth remembering that our freedom is bound with the freedom of others. Â Our independence an opportunity to end the centuries of imperialism which Scotland has both been a victim of and a party to. Dings the fell gallows o the burger doon. Will bring imperialism crashing down.